In a quest for satisfaction, many men have lost the meaning of manhood, surrendering ideals to things immoral, illegal, unethical or irresponsible. Today's tough times require men to overcome dangerous philosophies and bring hope, dignity and order back to a world in desperate need - men who are willing to be heroes. "What you believe is the basis for conduct, character, and destiny. While the world looks for better methods, God looks for better men." "Sometimes you meet a man who forever impacts the way you think and, most importantly, the way you live. Dr Edwin Louis Cole was such a man, and is such a man still, through his writing. Enjoy!" 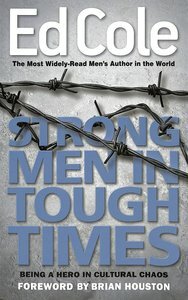 About "Strong Men in Tough Times"